The VW I.D. 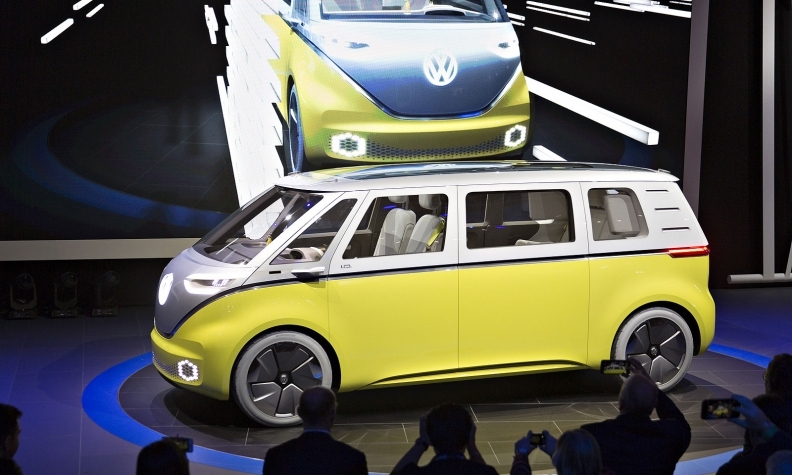 Buzz microbus concept debuted at Detroit auto show in January. Volkswagen brand CEO Herbert Diess is expected to announce on Saturday details regarding the production of the battery-powered I.D. Buzz microbus slated to debut in 2022, a company source told Automotive News Europe. The information on the Buzz, which is one of three electric vehicles that VW plans from its forthcoming I.D. family, will come at the Concours d'Elegance this weekend. The show, which is held at the Pebble Beach golf resort in California, is a favored location for carmakers to debut their most stylish and expensive cars as well as sleek new concepts. This year, Mercedes-Benz may be showing a Maybach roadster at the annual event. Diess will likely be joined by Eckhard Scholz, the head of Volkswagen's light commercial vehicle business, which manufactures the Transporter in Hanover, Germany, where all six generations of the van have been produced since 1956. “The two will make the address in connection with Pebble Beach,” said a source at the VW Group, adding the duo could reveal how development of the Buzz may be split up between the VW brand and VW LCV arms. Since 2002, VW has operated separate independent brands for its passenger car and LCV businesses due to the differences in their customer bases. From a legal perspective, however, they are both members of the VW Group. This means that there is no need for arm's length business dealing whereby the VW passenger car brand pays its commercial vehicle sibling royalties for using the iconic look of the first- and second-generation microbus, for example. Nevertheless, each brand maintains its own fully separate management board since the spin off fifteen years ago, so it would be advantageous if not necessary for Diess and Scholz to agree on how to develop, produce and market the I.D. Buzz. This could possibly include various electric derivatives of the Buzz patterned closely on the current sixth-generation Transporter, also known as the T6, that is built by Scholz’s division. The T6, for example, comes in versions that include the California camper model, the Caravelle shuttle bus or the variable Multivan. VW's union in Germany has been pushing management to build electric cars at its domestic sites to safeguard jobs in the transition to low-emissions vehicles with some success, as the I.D. hatchback will run off assembly lines in Zwickau starting 2020. The Hanover factory will soon begin assembling electric Crafter delivery vans using bodies built in Wrzesnia and Scholz's presence at the Concours d’Elegance could mean that his plant may very likely end up building versions of the I.D. Buzz microbus for both VW brands. Although Automotive News Europe reported already in January that the Buzz would be built, sources at the company said at the time that important details still had to be resolved. One aspect included the length, since the Buzz concept shown in Detroit was meant to show in part the flexibility of the MEB electric architecture. As such it was nearly 5 meters long, which would not likely be feasible for a series production model aimed at retail car buyers. VW is investing heavily in the MEB platform, which underpins its new EV family that so far consists of the I.D. hatchback, I.D. Crozz SUV and I.D. Buzz. The brand has earmarked a total budget of 5 billion euros through the end of 2021 for fixed capital investments, or roughly 1 billion per year, excluding r&d costs. Additionally, VW brand has sought to spread its electric vehicle message by replacing Hyundai-Kia as the automotive sponsor for UEFA's upcoming European championship soccer tournament in 2020. VW aims to use the prominence of stars such as Portugal's Cristiano Ronaldo as a platform to push the I.D. family.